Asubastar is an integral solution of automation, management and electronic auction, that supports different markets (fisheries, livestock, horticulture, floral… ), developed by Solutel Norte, engineering technologies with over 15 years of experience in the sector. Asubastar integrates on a single system the weighing, labeling, sale and withdrawal of purchases. 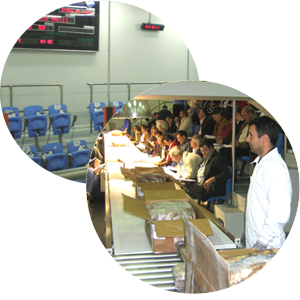 In an easy and intuitive way for the operator, streamlines all daily processes and ensures traceability. Asubastar develops and integrates devices ensuring the compatibility of all in a single application of management. Inputs of goods: installation of reception positions and bascules with labeled. Saleroom: manufacturing and mounting of screens and buyer controls. TIC infrastructure: servers, electronic network, backup systems. Withdrawal sales: identifying containers, handsets, expedition of goods. What are the advantages of this system of electronic auctions? The user interfaz is very intuitive and easy to discover. It provides an ideal starting point for new customers. It has a large functional coverage, which includes boats, species, buyers, sales, weighing, historical, etc. It’s compatible with different database engines and therefore, is possible to fit it to the needs of each installation. It allows a permanent development of the solution and it fits your needs without the complexity of having useless. It performs the communication with scales, labelers, conveyors, allowing a complete control of the installation from only one aplication. All new functionalities are installed automatically. Therefore, guarantee the permanent availability of the latest version. All jobs are set mechanically at the time of login. In case of damage, has data replication and instant change of server.